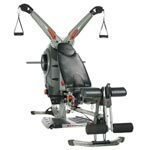 The Thane OrbiTrek elliptical exercise machine works several areas of your body simultaneously, which gives you an excellent cardiovascular workout while it tones your arms and legs. You can use the handles in stationary mode or workout mode for a lower body workout or a whole body workout. The open flywheel also cools you down as you workout. 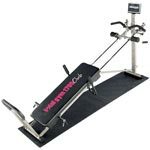 The elliptical rotation of the pedals and the vertical stride bars are engineered to simulate the natural movements of the human body. 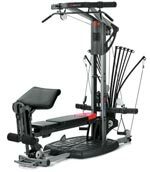 The Thane OrbiTrek Elliptical Trainer has been tested for effectiveness and durability by some of America's leading trainers, doctors and athletes. 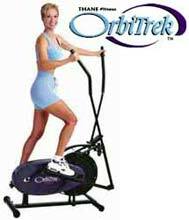 The OrbiTrek Elliptical is moveable and silent so you can move it easily and workout in any room without disturbing your family. Combined with a good diet, using the Thane Fitness Orbitrek Elliptical Machine can help burn fat, tone muscles, and give a great cardiac vascular workout. Extra wide platform pedals, made of sure-grip material so you can't slip. Dual-direction forward and backward elliptical action. Stride bars for upper body sculpting. Front mounted flywheel for stability and compactness. A stationary balance bar position for "free running." "Micro-adjustable" resistance dial that lets you control the amount of tension you want in degrees, not a couple of preset positions like other machines. Easy to read 4-way Fitness Monitor tracks speed, time, distance, and calories burned. Included with your Orbitrek purchase is a 20 minute workout video, a free video monitor, an accelerated weight loss plan, and a 1 YEAR WARRANTY! Silent operation allows you to workout anytime. Wheels make it easy to move from room to room.